Dr. Gallagher grew up outside Chicago and St. Louis. He spent four years in the US Navy. He aced the Pre-Med program at Washington University, one of the most academically challenging medical schools in the country. After his third year, he chose to move toward veterinary medicine after enjoying his part-time work at an area vet hospital. He was selected to receive the only scholarship offered to applicants for the first year of Veterinary School from the University of Missouri at Columbia. There he received his Doctorate of Veterinary Medicine in 1992. 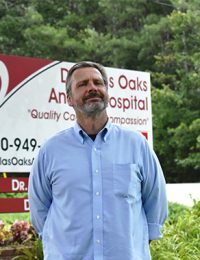 He was honored as the sole recipient of two separate awards, the Award for Proficiency for Small Animal Surgery and the Award for Proficiency in Small Animal Internal Medicine. He has been helping animals ever since. Dr. Gallagher is proud to provide Douglas County with quality veterinary care!